Available now, the first publication in “real book” hardback format of Terence Strong’s new thriller WORD OF WAR, coming from Silver Fox Press, the outfit the author first set up to publish his backlist in e-Book. BUY NOW using PayPal, author hand-signed copies available. Please note the postage & package options: UK, Europe and Rest of World when ordering. Set in the Middle East during the so-called Arab Spring, WORD OF WAR is the first of a high-octane trilogy featuring new male lead James ‘Rollo’ Royce as a former SBS close protection officer minding a feisty female journalist Jo Brampton who doesn’t want protecting – but it seems that MI6 has different ideas for both of them. Friday 22nd September: WOW’s “Guess The Title” Competition has been won! 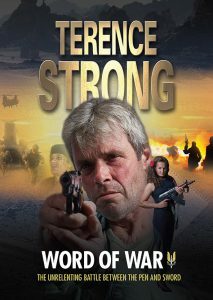 Phil Bridger from Lapworth in Warwickshire had his name drawn from those who guessed correctly that the new Terence Strong thriller is entitled WORD OF WAR. A personally author-signed copy of the hardback and a £25 Amazon voucher will be winging its way to him as soon as the first edition arrives. Congratulations! Monday 2nd October: ISIS Soundings lauched a new full-length audio version of the classic million-selling SAS classic WHISPER WHO DARES for your mp3s. It’s the first to be recorded by the “new voice of Terence Strong”, actor Simon Mattacks, whose next task will be to read the author’s new hardback WORD OF WAR. Both editions will be available before Christmas.